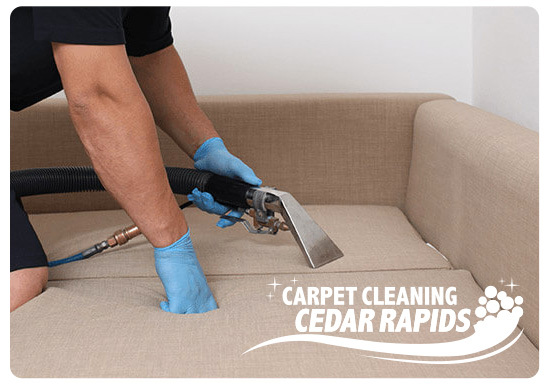 Upholstery Cleaning Cedar Rapids – the solution for all your needs! If you are looking for a professional upholstery cleaner Cedar Rapids wide, then we are the specialists for you. Utilizing an efficient and effective cleaning system, we revitalize tour furnishings and make the appear new and smell good. We rid of the dirt in your sofas, couches, curtains, chairs, arm chairs and cushions and make them look marvelous once more! Our professional Iowa cleaners have the knowledge and experience to get rid of all the dirt and stains and also remove all dust mites that may have invaded your furniture. Regardless of the type of property- whether residential, commercial or office- we have all the solutions you need. We offer a wide range of expert cleaning solutions specifically customized for all kinds of fabric and furniture. If you’d wish to get expert advice about our method, contact us and talk to one of our professional Cedar Rapids, IA, upholstery cleaners. We start by hoovering your furniture to remove loose dirt. Where necessary we utilize a non-toxic remover to remove all those unsightly stains. We then apply an effective shampoo which we brush into the material. This is afterwards extracted through the use of hot water. The process is fast-drying, making it possible for you to see, as well as feel, the wonderful results in a short period of time, if you require your furnishings to be cleaned specially for a significant date then we are also on-hand for emergency upholstery cleaning. We are available at short notice regardless of where in Iowa & IA you are based. Our experts get to your premises on time and only depart after your furnishings are completely transformed- all at a cost-effective price! Get in touch with us today and experience the effective results our Cedar Rapids furniture and upholstery cleaners can deliver. We’re also experts in stain & odor removals. For a free, no-obligation estimate, call our Iowa-based team today on 319-409-6206.